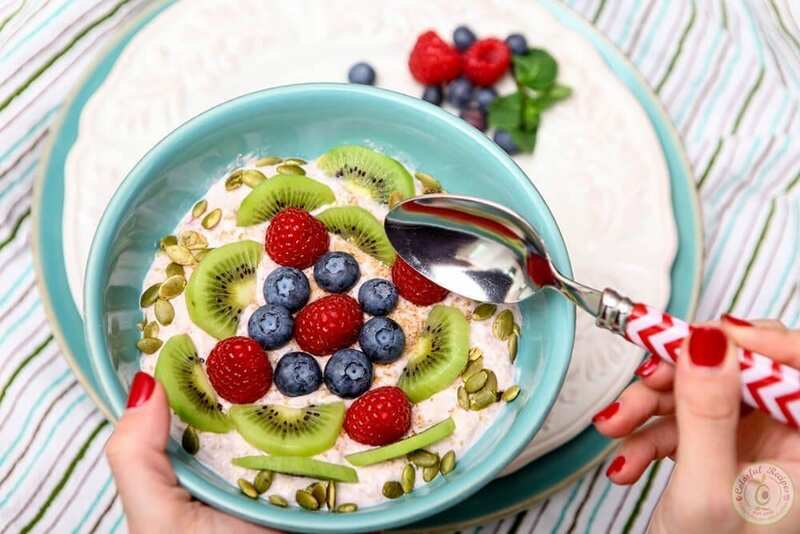 Any nutritionist will tell you that starting your day optimally involves a healthy breakfast – though searching for the perfect breakfast recipe can be quite a task. Sort of like trying to decide on your next Netflix series, there’s just so many options to scroll through! In addition, you may get health facts lost in translation, with one article swearing you should never eat dairy again, and another celebrating all the benefits of greek yogurt or kefir. Then by the time you’ve spent a few hours flipping to and from food blogs and endless breakfast recipes you end up in your comfort zone eating what you’ve always had for breakfast. We thought we’d end the debate once and for all and settle on 3 fail-proof breakfast recipes that have all the energy-packed slow burning calories, protein, vitamins, minerals and fibre to target exactly what your body needs for optimum health at the start of each day. In a bowl or mason jar, mix together milk, tahini, vanilla extract, and maple syrup. Add the oats, thoroughly mixing everything together. Cover the bowl with plastic wrap and set in the refrigerator overnight. The next morning, in an additional bowl, stir together tahini, maple syrup, milk, cinnamon and salt, until creamy. Remove overnight oats from the refrigerator, and place in a serving bowl. Top with vanilla yogurt and banana slices. Drizzle the creamy tahini over the bowl, and sprinkle with sesame seeds. Notes: This will make more than you need for a single serving, so store in refrigerator for up to a week. Save for additional overnight bowls and feel free to add seeds, nuts, honey, peanut butter, coconut flakes, or dried fruit. Next up is our very own dreamy creamy concoction we mastered here at The School of Natural Health Sciences. 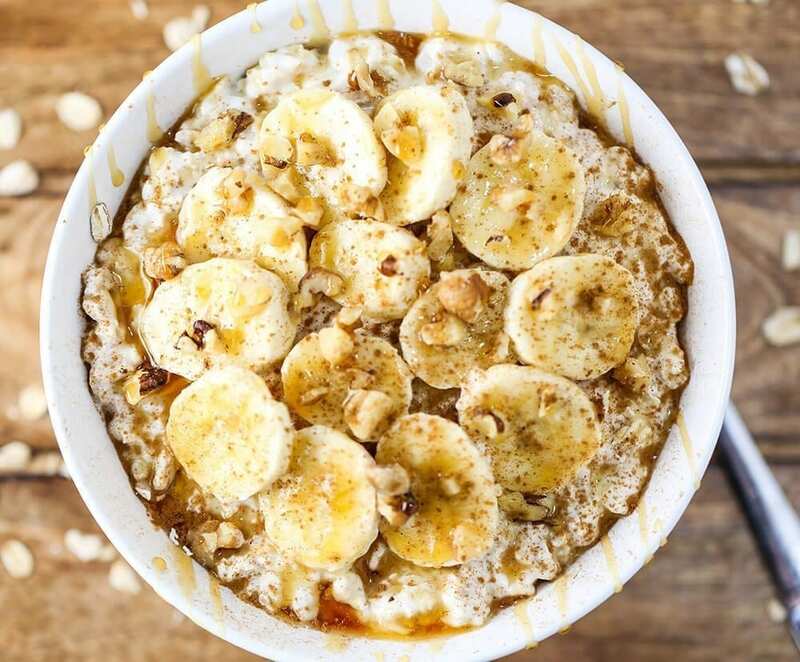 Similar to an oatmeal breakfast, but tasting more like a gourmet delicacy, it’s flavour and consistency is quite unique. A combination of mineral-rich seeds and nuts whizzed up in a coffee grinder, and met in a bowl with organic kefir, bee pollen, a fruit of your choice and a dash of organic honey. You can either buy individual packets of various seeds and nuts, or get mixed packs that might have chia seeds or other good-for-you additions. It all depends on what’s available near you and what your preferences are. In-house recipe, 🙂 Makes 1 good-sized breakfast bowl. Whizz the flaxseed (and any nuts of your choice) in a coffee grinder for no more than 5 seconds and pour into a bowl. A small grinder is all you need for this task, preferably electric. These should retail for less than 20 bucks. Post-cleaning is pretty simple too, use a dry paper towel to wipe out the remnants after each use. Next, add a good serving of kefir and then plop a handful of fruit in for juicy freshness. We can’t get enough of blueberries and pomegranate! Pepper a teaspoon of bee pollen to introduce some magic. This really sweetens the deal. 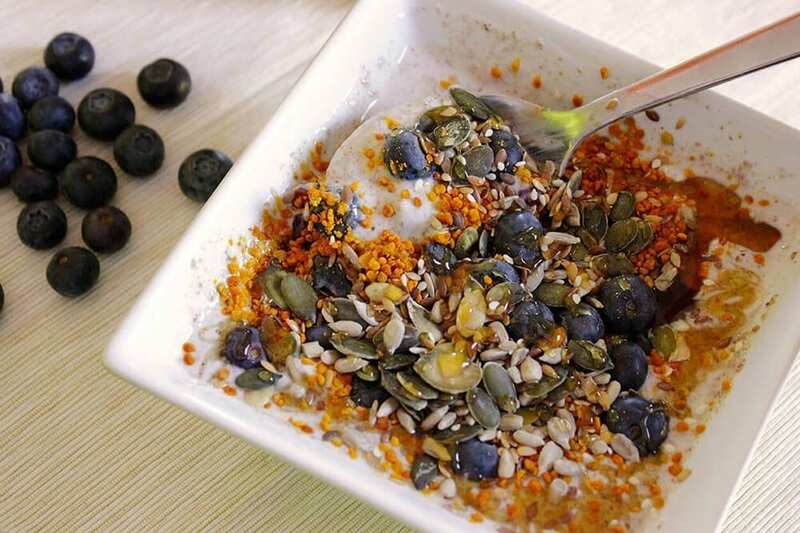 Sprinkle a fair amount of sunflower seeds, sesame seeds and pumpkin seeds on top with some goji berries. (This adds a nice satisfying chewy crunch to an otherwise soft meal). Then drizzle with as much honey as required. Voilà! Your breakfast is ready for mindful eating. Notes: Remember that any nuts or seeds used in this recipe need to be 100% natural, uncooked and without added salt or sugar. We like to use flaxseeds as the bulk ingredient in this preparation, but you don’t have to. Try blending walnuts, hazelnuts and almonds together for a seriously nutty breakfast instead. That’s the fun part, you can try different combinations and see what you like best. Careful not to whizz for too long though, especially when grinding nuts, or you’ll end up with butter! Peel and slice your apple thinly. Then, steam the slices over boiling water or in the microwave until soft. Using a food processor or blender, blend the egg whites, apple fiber (or flaxseed), cooked sweet potato, and protein powder together to make a pancake batter. Coat a medium nonstick pan with coconut oil and place over medium-high heat. When the pan is hot, start pouring your batter onto it. (You want the pan to be hot enough so you hear a sizzle when you add the batter.) Bring the heat down to medium so the pancakes cook evenly. Once bubbles begin to appear on the pancakes’ surface, flip them. Transfer to a warm plate and repeat with remaining batter. 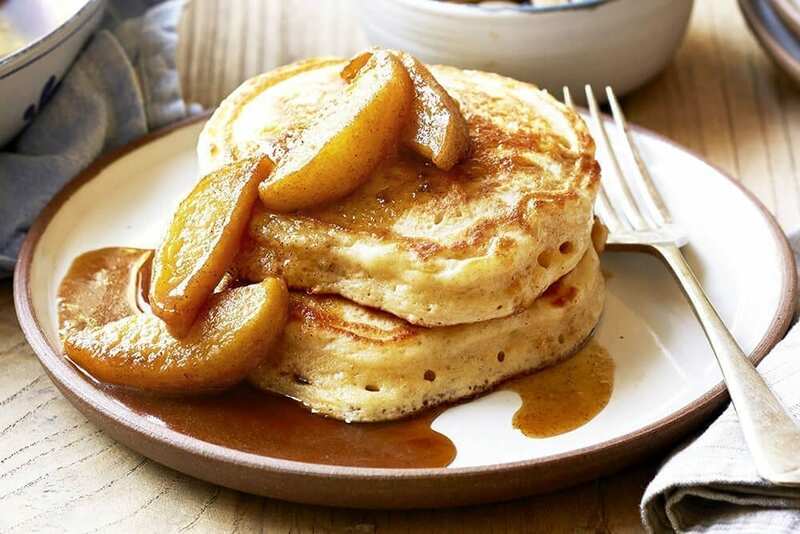 When the pancakes are done, stack them up, alternating with layers of apple slices, and sprinkle with cinnamon to serve. Get the vanilla whey protein powder used in this recipe right here. And the book here.